early warning of smoke and fire. Smoke detector is a product that sensing smoke as an early warning of fire. 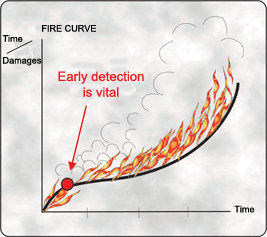 Early detection of smoke and fire is vital. Smoke alarm from smoke detectors can save your life. Smoke alarm from smoke detectors protecting properties from fire damages. Room smoke detectors are mounted in ceiling of rooms. Duct smoke detectors are mounted in ventilation ducts. The true duct smoke detector is able to detect smoke at a very early stage in the rough environment of a ventilation duct without giving false alarms. The true duct smoke detector is an optical obscuration designed to function inside the ventilation duct. 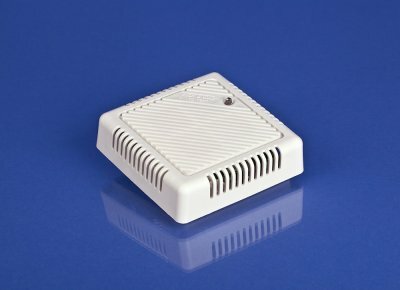 The sensing part of the true duct smoke detector covers as much as possible of the duct. An infrared beam is transmitting through the sensing tube in the duct and if smoke present the beam is obscured to some extent and an alarm signal is given. The true duct smoke detector has an adjustable level of sensitivity that goes from 3 to 25% (0,1 to 0,9 db/m) obscurity for all different environments that can exist in a duct. You may ask, how does the true duct smoke detector cope with dust? It surely must affect this true duct smoke detector as well. Dust is always present in the return air duct as is air velocity. The air will inevitably bring dust and this will stick to the true duct smoke detector optical parts, however, the electronics constantly monitor the obscuration within the sensing tube. The air brings along dust and particles that of course also catches of the duct smoke detector. Despite it manage to be dirty without making a false alarm and without loosing its sensitivity and as the level changes slowly over a long period of time (weeks or months). The signal of the true duct smoke detector is adjusted to compensate for this build of dust, however, should the obscuration change rapidly (seconds) this is signalled as smoke and will cause an alarm after an initial delay to compensate for drops of water or dust that disturbed from duct wall etc. Fire Alarm- and BMS-system, both digital and analogue, as standard there is two alarm output with an open switch for smoke alarm and one analogue 2-10 Vdc for an output service alarm. The internal calibration of the true duct smoke detector is provided at an outgoing terminal in order that the level may be seen if connected, for example, to a BMS-system. 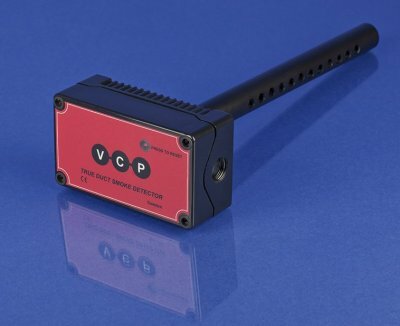 The true duct smoke detector analogue output status levels is 2-10 Vdc. 7-9 Vdc means optics needs cleaning and 9.5 V dc means smoke alarm. Normal maintenance staff without previous training can clean true duct smoke detector . If they can clean a pair of glasses they can clean the true duct smoke detector, it is the same technique. This provides a better economic solution for the Life Cycle Cost, LCC for the end user. optical room smoke detector type is also named as photoelectric room smoke detector type.